Yesterday was ‘Friday Night with Friends’ link up night at Gone Stitching, I rather like the idea of linking up with other sewers around the world, all sewing and creating at the same time and then swopping ideas. I finally managed to complete my 100 hugs quilt last night! I started making the quilt in October for a friend due in January, I don’t know if it’s a boy or girl so decided on using Moda Storytime as it’s green, yellow, taupe and peach, in other words it’s not too pink!! I found the inspiration and instructions on Wedding Dress Blue, I love the name “100 hugs”, it’s so apt for a baby quilt. The top went together fairly easily, although I did find I wasn’t very good at stitching across a diagonal, some of the triangles left a bit to be desired!! I basted the top, wadding and backing fabric together, I found a quilting design of hearts and circles which I thought it was rather apt! 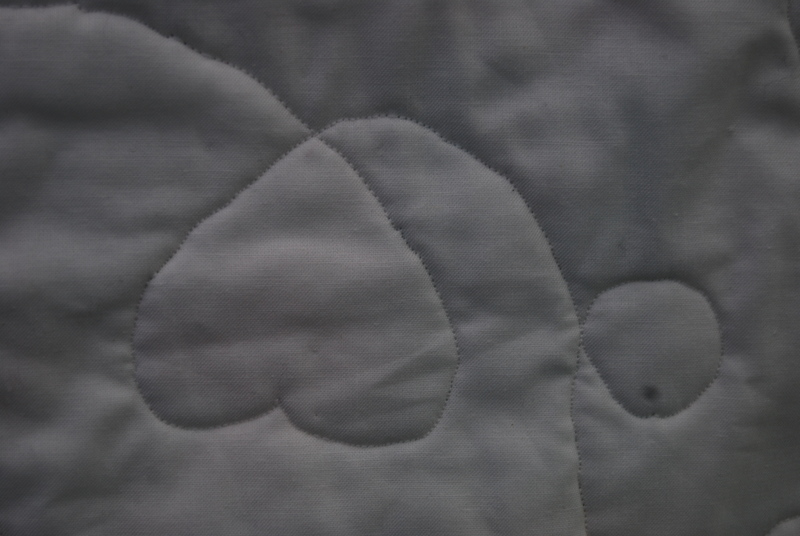 I had issues with the air erasable pen again…I cut out the heart shape and then drew the design on the quilt, only to find it was disappearing a lot quicker than I could sew it!! I noticed the ink on white areas stayed so I decided to quilt from the back which was white. Tips from a newbie to other newbies, test the lasting qualities of your pen first! consider quilting from the back if doing a free hand design, there’s no seams to put you off but baste your outer edges clearly, always stop with your needle down so the quilt doesn’t move and ensure the quilt is well supported, wear gloves to grip the fabric, I would never have appreciated this before I tried it, but my shoulders killed by the end of the quilting session from the strain of holding the fabric correctly. I’m pleased with my first attempt at machine quilting, it’s not perfect by a long stretch, there’s a lot of wobbly hearts and lines, but it’s acceptable enough to think I may have a go quilting a single bed top that’s just waiting to be quilted! This entry was posted in Crafts, Serendipity, Sewing and tagged 100 hugs, patchwork, Quilting. Bookmark the permalink. I, too, started my blog to keep me quilting and gardening. 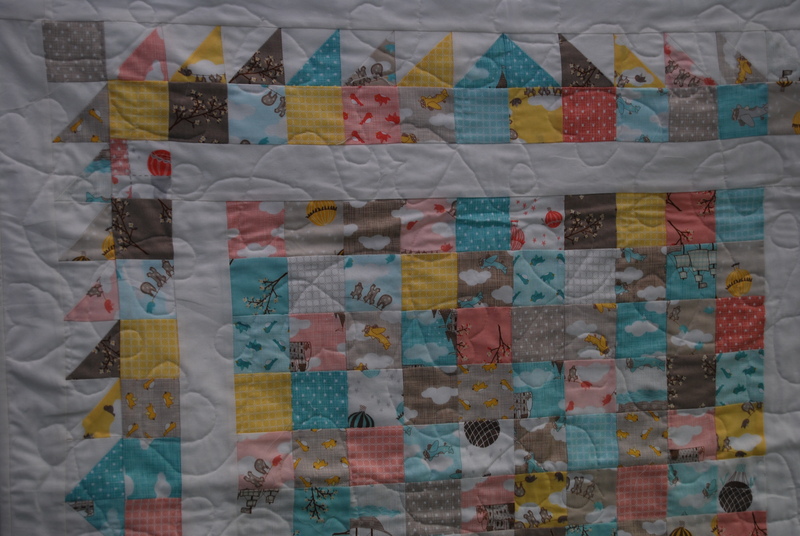 Love your baby quilt – it’s darling. 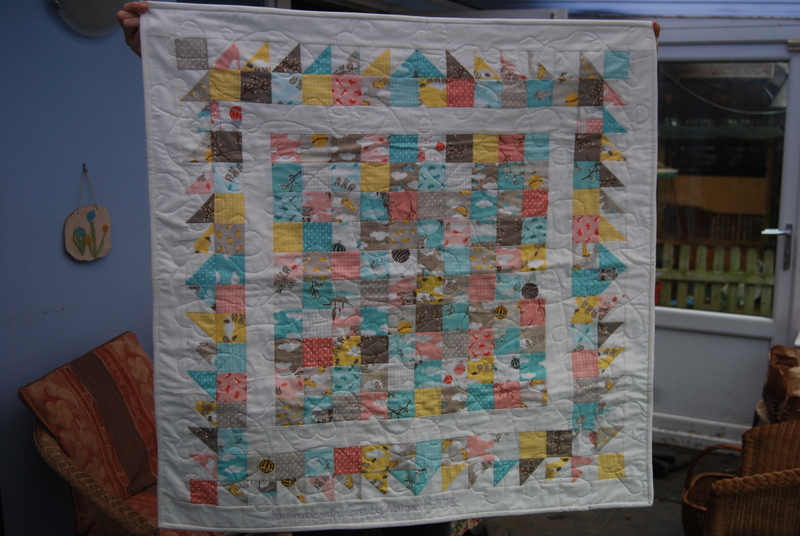 You might like to also link to http://mychellem.blogspot.com/search/label/Let%27s%20Make%20Baby%20Quilts She has a linky party for baby quilts and I’m sure they would like to see yours. Nice tips too. Your quilting is great. It looks great! Can I add this to the Hundred Hugs gallery? How fun to come from Deanna’s site to read your post about your quilt. Thanks for leaving a link. And now that baby is 18 months old!